Would you like to build your own Digital Passive Income Generating Information Product in YOUR area of proven knowledge/competence/expertise, BUT worry that you may lack time/training to START, and FINISH it? Let me do all the work for you as a Ghost-Writer (research, writing, recording, book cover design, book publishing, audio/video DVD Information Products creation etc) . In other words, I will help you write, design and publish a PHYSICAL BOOK to MONETIZE your knowledge and expertise in your vocation or profession. We can do it face to face or remotely. It won’t matter. I will interview you (and record/transcribe what you say) on the topic, to get what you know in written form. Then I’ll use my wealth of experience to research the subject to add more to what you give me. I will then combine it all, creatively, to make a ready-to-sell Information Product in PDF format, with front and back book cover designs for a PRINT version – both will be put up for sale in an online store I will setup for you. NB: You will be the author, and you will own the content and copyright. I would literally NOT exist …except to YOU. What Do You Get When I’m Done? NB: If you’re already a member of my Inner Circle, you ONLY need to pay 35% of the N50k promo offer fee (as per your lifetime 65% discount membership benefit). My standard fee for ghost-writing/publishing a book as above is N150k. But for this offer, I will do it FREE for ALL 4 of those who take up this offer within the deadline. Below: Photo of Cotonou based Dr. Arnold Nana Kouayep, holding a physical copy of his book (ghostwritten by me in 2015) – after 10 copies I ordered from his online store were delivered by UPS to hi office. 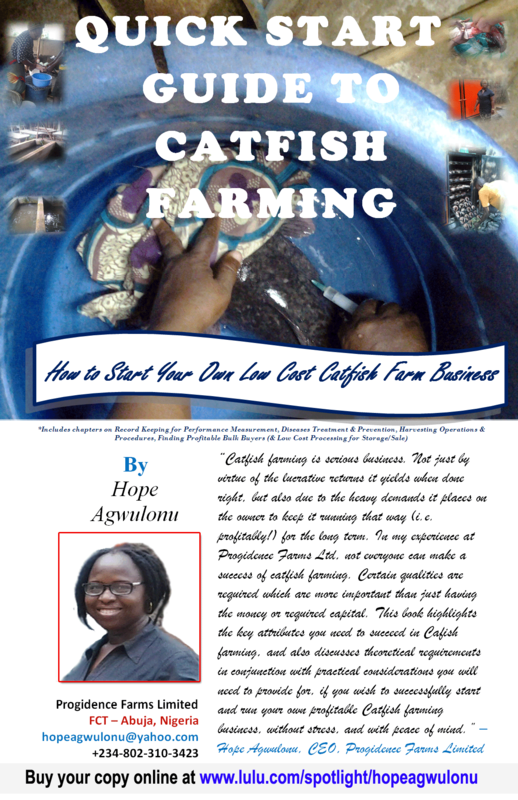 Below: Book Cover Announcement of Hope Agwulonu’s Quick Start Guide to Catfish Farm Business Which Was Published Via My Book Ghost-Writing Print On Demand Publishing Service in 2016. Click the link below to read more about this project with Hope. You can visit her online store to see the book on sale at www.lulu.com/spotlight/hopeagwulonu [She also has the MS Word manuscript and a read-for-use PDF version which she can email to buyers who pay directly to her bank. b. create other DCFGAs by yourself – including detailed instructions of where to go to download FREE tools/resources for creating your own branded range of digital products, like I do. My standard fee for One-on-One Coaching is N50k. But for this offer, I will do it FREE for ALL 4 of those who take up this offer within the deadline. The above means that instead of paying N200k, I will do 1 and 2 for you, at ZERO COST! Subsequently, you will pay at least N10k every month, until the full N50k fee is paid up. On my part, as a gesture of goodwill, once you pay up to N30k, I will formally commence work with you as per the FREE offer in 1 and 2 above. Regarding your membership benefits, once your N50k fee is fully paid up, I will send you the promised FREE product of your choice from my Inner Circle members library (e.g. my Livestock Ration Formulator software, Poultry Farm Manger software or my Payslip Generator software or any of my Information Products that you choose) as well as other gifts that members are eligible to receive. You also get your 65% lifetime discount to buy ALL my other products and services. To get Your Own Digital Cash Flow Generating Asset (DCFGA) Built by Me…. 2. You can pay the N50k offer fee at once, or tie down the offer by paying at least N10k BEFORE the deadline expires, then paying monthly instalments of at least N10k till the full N50k fee is paid up. 4. When your payments are completed at N50k, I’ll send you ANY FREE product you want, and activate your 65% discount to purchase ANY of my other products and services, as a member of my Inner Circle. 5. This entire offer expires at Midnight today Thursday 27th April 2017 – and ONLY 2 slots are available on a first-come, first-served basis. a. If you pay N20k before Midnight today Thursday 27th April 2017, you WILL get a further N10k discount i.e. instead of paying a total of N30k balance, you ONLY pay N20k balance, meaning you’ll end up paying ONLY N40k in total, instead of N50k to take up this offer. b. If you’re already a member of my Inner Cirle, you ONLY need to pay 35% of the N50k promo offer fee (as per your lifetime 65% discount membership benefit). c. If you’ve attended my talk (and/or purchased my Audio DVD) on Passive Income generation, and you’re interested in this offer, email or send me an SMS and I’ll hold a slot for you to take up on or before the deadline.. Bonus Offer: Get a Branded 3 to 5 Minute Trailer Video to Promote Your New Product On Youtube Once It’s Ready! Why Am I Making This Kind of Offer? I am on a mission to SHOW others that they can also achieve the kind of success I enjoy via Passive Income Streams generation using my branded Digital Cash Flow Generating Assets. If YOU begin earning passive income using the cash flow/passive income generating asset I build for you, others will BELIEVE it is possible. Then they will be motivated to take PERSONAL ACTION to do what you’re doing, thereby empowering themselves to be financially independent. When YOU, and others who are so impacted succeed, I WILL naturally succeed as well, because you would provide REAL LIFE testimonial case studies for me to point out to MORE potential clients! This was handed over on Sunday 12th July 2015 p.m (when we met for a private session) – to a newsletter subscriber who paid for it on Monday 6th July 2015, but was unable to join us at Tantalizers Fast Foods Restaurant, along Ojodu-Berger Road, in Nigeria’s Lagos, on Wednesday, 8th July 2015, for the face to face coaching session I had with others on the subject. Want a copy of the Audio DVD? Price is N5k. Click here to let me know. You can invite me to deliver my FREE 1 hour talk on this subject members of your group, team, company/organization. Click here to view the flyer for the maiden talk held on Sunday 5th July 2015. Click here to invite me.